Hanmi Pharmaceutical, once an 8 trillion won ($6.76 billion) deal maker with global pharma partners, is currently stuck in free fall. Hanmi Pharmaceutical Chairman Lim Sung-ki and his family’s stock asset value dropped by over 1 trillion won in a week in October as the nation’s pioneering local drugmaker was hit in a scandal over its German partner’s withdrawal from a deal, a belated disclosure and suspected insider trading. On Sept. 30, Hanmi Pharmaceutical publicly disclosed that its German partner Boehringer Ingelheim returned development and commercializing rights of Olmutinib, a third-generation lung cancer therapy. After the disclosure was made, Hanmi’s shares plunged 18.06 percent. The volume of short selling involved 104,327 Hanmi shares, the largest since the firm was listed on the Kospi exchange in July 2010. The local drugmaker’s holding company Hanmi Science’s stock price also dropped 34.1 percent, from 139,500 won on Sept. 29 to 91,900 won on Oct. 7. The market cap of Hanmi Science went down from 8.13 trillion won to 5.35 trillion won over the same period. 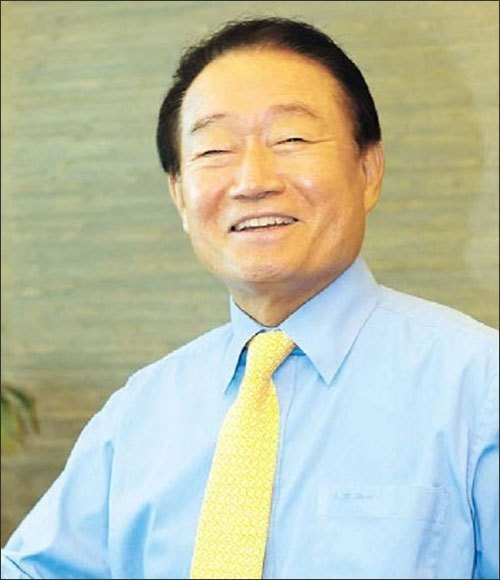 During the one-week period, Lim Sung-ki, chairman and founder of Hanmi Pharmaceutical, saw his shares value drop from 2.83 trillion won to 1.87 trillion won. Lim is a major shareholder with 34.91 percent in Hanmi Science shares. Between 2013 and 2015, Lim’s stock asset had skyrocketed from 272.4 billion won on June 28, 2013 to 3.27 trillion won on July 2, 2015. The company enjoyed its heyday in 2015. It executed 8 trillion won worth of deals to export technologies to six global pharma giants that year. The deals were made with Eli Lilly and Company in March, Boehringer Ingelheim in July and Sanofi, Janssen and ZAI Lab in November. Buoyed by the series of jackpot deals, the stock price of Hanmi Science and its unit Hanmi Pharmaceutical rallied. 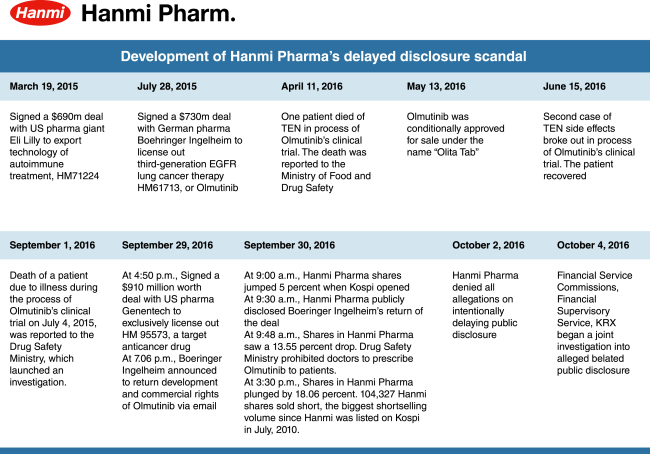 Hanmi shares soared by some 10 percent a day after the deal with Boehringer Ingelheim was publicly disclosed on July 28, 2015. In November last year, Hanmi inked three deals consecutively to license out its diabetes therapy Quantum Project and other treatments for diabetes, obesity and lung cancer to global pharmaceuticals. The deals were made with Sanofi for 3.9 billion euros ($4.1 billion), Janssen for $915 million and ZAI Lab for $85 million. Lim’s Hanmi shares had skyrocketed from 2.85 trillion won on Oct. 2, 2015, to 3.68 trillion won on Nov. 6, 2015 right after the Sanofi deal was disclosed.